On November 20, 2017 - The Rockin' Robin took a moment out of his schedule to donate his time (and more) during the annual Mayflower Marathon to benefit The Open Pantry! On the first day of the event, Dave (The Rockin' Robin) was given the opportunity to perform Live On-The-Air and he performed "Sweet Caroline"! 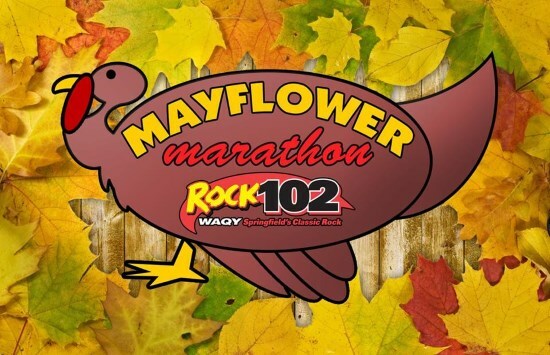 The Mayflower Marathon is hosted by the radio station WAQY, ROCK 102 FM - Springfield's Classic Rock. The stations' very own Bax & O'Brien Morning Crew broadcasted LIVE for 52 Hours from the South parking lot of the Basketball Hall Of Fame in downtown Springfield! Their goal was to fill three, 48-foot tractor trailers with non-perishable food donations for the Open Pantry (Open Pantry Community Services, Inc). Monetary Donations were also accepted on site (and Online) from collections taken up by Businesses, Schools and Individuals! Throughout the event, Special Guests, Businesses and Lots of Great People from the surrounding area stopped by the Hall of Fame to drop off their donations, meet the Radio Crew and in some cases actively participate in On Air antics and interviews! Capital Moving & Storagem Inc.
Hilton Garden Inn - Springfield, MA! Visit Bax & O'Brien and ROCK 102 - Springfield's Classic Rock!